It can never just be as simple as snacks and a jam with The Doctor can it? 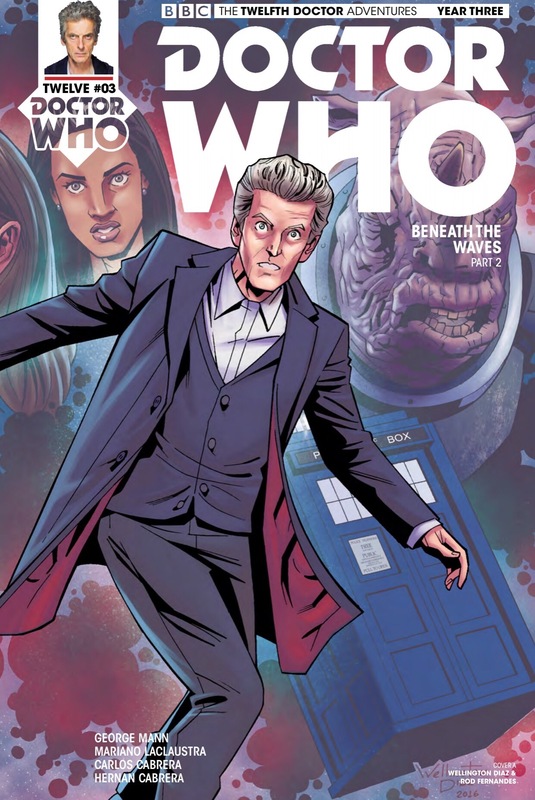 After being reunited with his old companion Hattie in the last issue, The Doctor and his companion find themselves whisked away by the TARDIS to Seaton Bay, England in the year 1979. What Hattie mistakes as a “simple stop for chips”, quickly escalates into being chased down by what looks to be large husks of seaweed. We pick up from the last issue with Hattie suffering from a migraine on steroids, whilst having visions of images in black and white. The Doctor is saved from one of the sea-weed creatures by a fiesty old lady with some skills with a cane. As they are retreating back to the hotel, the Doctor explains to Hattie that her visions/migraines are being caused by the living sea-weed due to them transmitting a psychic broadcast that she is receptive to. The transmissions not being compatible with her brain is what’s causing her pain. After escaping the husks, The Doctor, Hattie, and the rest of the Hotel patrons group together to try and come up with a course of action. But first, the doctor must make a cup of tea. Once the Doctor heads to the kitchen, the husks start attempting to break down the front door. Hattie rally’s the team, directing them to find the closest thing that they can use as a weapon. Mike the bellhop oddly enough finds a hose. As the kettle in kitchen whistles, another husk outside of the kitchen window breaks in. In the moments of the creature breaking in, the Doctor has a eureka moment. Unfortunately the creature grabs the Doctor, its contact putting him into a coma state. As the group prepares for an impending attack, another old ladies notices that there is another creature coming from behind them and warns the group. Hattie (with the help of Mike’s handy fire hose) dispatches the creature. It is only then that they realize that the creature had come from the direction of the kitchen. As they stand in shock at the Doctor laying incapacitated, Mike informs everyone that his symptoms are like that of “the others”. The rest of the group is introduced to Dr. Brown, who has been working on a couple other patients with the same “virus”. While Hattie tries to explain to Dr. Brown that it’s not a virus, she is hit once again by the psychic transmission signaling that the monsters are close. They all rush upstairs to an empty guest room and barricade themselves in. It all seems for naught as one of the creature breaks through their barricade. Hattie jumps infront of the older woman to protect them, just as the Doctor appears at the door with screwdriver in hand to stop the creature. 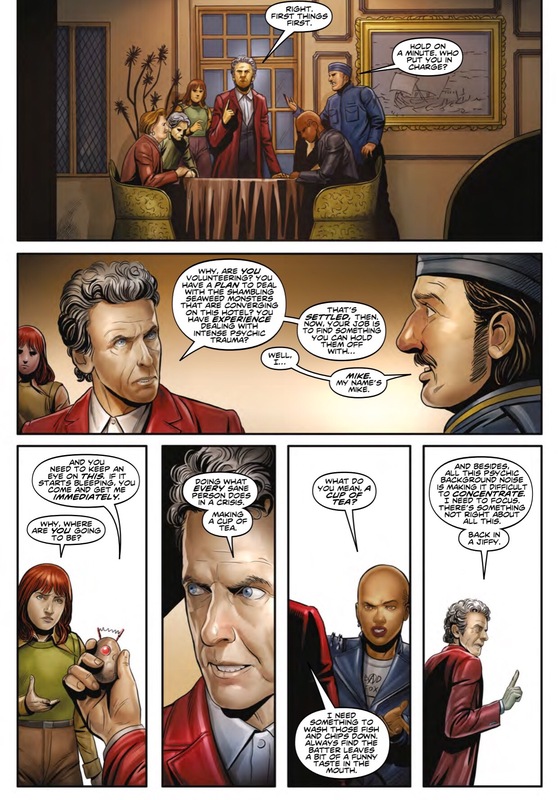 The Doctor explains that the the psychic transmissions have been directed towards him this entire time and that he would handle things from here on out. 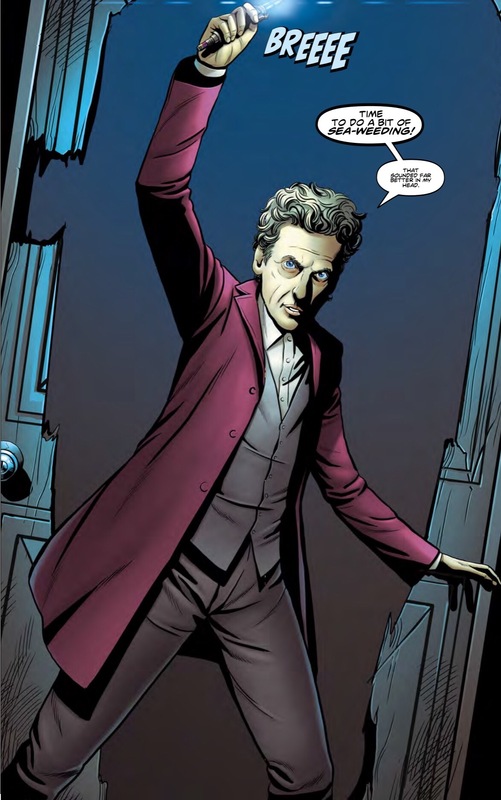 Going along with the creature’s the Doctor promises to be back for Hattie, and that they should all be safe from this point out. The issue ends with the Doctor, now prisoner of the husks being escorted into the bay. I’m curious how this all plays out, but as we know when the Doctor makes a promise, he always keeps it. Unfortunately that episode is one of the sub-standard ones. Aside from her attitude, Hattie feels like just another run of the mill companion. Posted in Comic Books, Reviews.